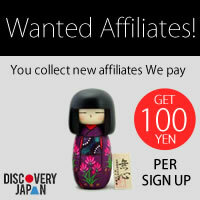 Hi everyone, I'm administrator of this website "Discovery Japan" . Discovery Japan is community website which is related with Japanese items , culture , history. Just post pinctures what you like on DJ and share with us ! Message from our CEO – “I want to tell the world about Japan” Hello. My name is Norio Itabashi. I have launched my company’s own business (an E-Commerce Shopping Cart Provider- Live Commerce ™) for international EC mail order sales of Japanese products. I think that the ordinary products we often take for granted when we use and enjoy them every day—fashions, anime, buildings, garments, food, and toys--were actually created with great care and craftsmanship, and Japanese products such as these are world-class quality. When I have traveled abroad, I have noticed the goodness of Japanese products. When it comes to toys or food, you may suddenly feel “this is terrific!” and your heart is captured, and your face breaks into a smile. In this way, Japanese products enrich life and make a new life worth living. Wouldn’t it be fabulous to be able to convey this experience to the world? By continuously conveying Japan to the world, I want to add even one person to the people whose hearts are enriched, and I have incorporated this concept into our company mission.